In addition to the News Posts below, we also send a periodic eNewsletter. You can view our newsletter archive here and you can sign up to receive future emails at the bottom of this page. Our February Members and Friends Newsletter is here for your reading enjoyment! We had an exciting year at Iowa Young Birders - several fun and educational field trips, an extended birding experience to Colorado, several partnerships, and much more! Our full impact can be seen in our year-end report below. Iowa Young Birders member Coralee Bodeker is using her artistic talents to raise funds for raptor conservation! Coralee recently composed an article to raise awareness about the decline of American Kestrel populations as part of her regular series, "A Prairie Girl's Notebook". She also sketched an American Kestrel on canvas that she is auctioning on Ebay to raise funds for raptor conservation. View the links below to read Coralee's article and bid on her one-and-only canvas print of the American Kestrel. Bid now to help Coralee contribute to raptor conservation! You can also view Coralee's print for auction here. On January 21, 2017, 11 young birders, parents, and grandparents joined us for a visit to Dale Maffitt Reservoir, a popular waterfowl wintering location south of Des Moines. It was foggy, but temperatures hovered around 40 degrees making it a pleasant morning for birding. Our target bird for the day was the Trumpeter Swan. Upwards of 200 swans had been reported at this location this winter and we were excited to see how many were around that morning. Upon arrival and a short hike, we quickly counted 81 swans on the water! We discussed the differences in appearance between adult and juvenile swans, and enjoyed close looks at these fabulous birds on the water and flying overhead. After studying the swans, we continued hiking along a nature trail around the lake. We were unsuccessful in our search for roosting owls in the pines along the trail, but enjoyed the usual winter songbirds including Dark-eyed Junco, Northern Cardinal, and various woodpecker species. We were even treated with a small flock of Eastern Bluebirds. While observing the bluebirds, we were surprised to hear a Greater White-fronted Goose calling overhead. We moved quickly to the edge of the water to locate two Greater White-fronted Geese mingling among the Canada Geese and Trumpeter Swans. We also saw two drake Redheads and a female Ruddy Duck, and were treated with the opportunity carefully compare three Cackling Geese with the nearby Canada Geese while learning about the differences in these two species. It was certainly a fun and educational morning! You can view photos from our trip here as well as our species list here. See you on our next trip! See what we've been up to this fall in our November Member and Friends Newsletter! Twenty-seven young birders, parents, grandparents, and volunteers met at Port Louisa National Wildlife Refuge (NWR) on November 12, 2016 for our first Waterfowl Migration and Conservation Day. Although a bit chilly in the morning, the sun was shining and it looked to be a fabulous day for this unique opportunity to tour the Refuge during the peak of waterfowl migration. The latest report said 25,000 ducks on the Refuge! Needless to say, we were all excited and quickly loaded the vehicles to begin the tour. The Louisa Division of Port Louisa NWR, the area we visited, is closed each year from September 15 – December 31 to minimize disturbance to migrating waterbirds as they rest on their southward journey. Therefore, we were very lucky to be visiting this area as part of their annual fall migration bus tours. Cathy Nigg (Refuge Manager) and Jessica Bolser (Refuge Biologist) of the U.S. Fish and Wildlife Service were our tour leaders, providing a wealth of information about the unique habitats on the Refuge and their significance. The importance of this area to migrating waterbirds was quickly evident to us as hundreds of ducks were in view upon entering the Refuge. Among the many ducks, we identified Wood Ducks, Mallards, Northern Pintail, and Northern Shovelers. A group of eight Trumpeter Swans was also a nice surprise! As we continued our tour of the Refuge, several Ring-billed Gulls and Double-crested Comorants were seen flying overhead. An extra special treat for one of the vehicles was an extremely cooperative American Bittern standing less than five feet from the road. We stopped briefly at the viewing platform overlooking Fox Pond, where we added Red-winged Blackbird, Swamp Sparrow, and American Goldfinch to our list. We also had great looks at a Bald Eagle nest on the east side of the Refuge. We finished our drive along the east side of the Refuge, where thousands of ducks were lifting off offering an amazing spectacle described as a “duck-nado” by our group. Unfortunately, we were unable to plant trees due to high water levels. However, we had an enjoyable afternoon hiking trails around the Port Louisa Visitor’s Center. Exciting birds included a Tufted Titmouse, several White-throated Sparrows, and a small group of Cedar Waxwings. We’re extremely grateful to Cathy Nigg, Jessica Bolser, and the staff and friends of Port Louisa NWR for hosting us. Many thanks also to volunteer Kevin Murphy for his leadership. And as always, we’re thankful to the parents and grandparents for providing the transportation means for the young birders to join us! You can view photos from our trip here and a list of species here. Seven young birders and parents joined us at Ada Hayden Heritage Park in central Iowa for a pleasant fall morning searching for sparrows and other fall migrants. Ada Hayden Heritage Park has a diversity of habitats and we were anxious to see what we could find on our walk! Starting off on the paved trail around the north lake, we were quickly greeted by a large flock of Cedar Waxwings with a couple Eastern Bluebirds mixed in. It’s always enjoyable to see these two species (even though the Cedar Waxwings were looking a bit drab) and we took the opportunity to carefully study them at close range. We continued our walk along the paved trail, observing Red-winged Blackbirds overhead and a small group of American Coots on the main lake. We next ventured onto the upland trail for hopes of spotting some fall sparrows. As if on cue, a Ring-necked Pheasant flushed started on the upland trail, one of several we would see on the trip. Then, one of the young birders spotted an Eastern Phoebe perched on a prairie plant in the distance, a bird that will not likely be sticking around Iowa for much longer. We continued along the upland trail, flushing a few unidentified sparrows before finally getting close looks at a cooperative Song Sparrow. We also learned the call note of the White-throated Sparrow, hearing several as we continued our venture. We arrived at Jensen Pond along the trail, where we quietly observed a group of Canada Geese and tried hard to get looks at a chattering Belted Kingfisher. As we returned to the parking lot, the birding slowed a bit and we had a great time studying various caterpillars found by the young birders along the upland trail. While doing so, we heard more White-throated Sparrows and observed both a Red-tailed and Broad-winged Hawk soar overhead. 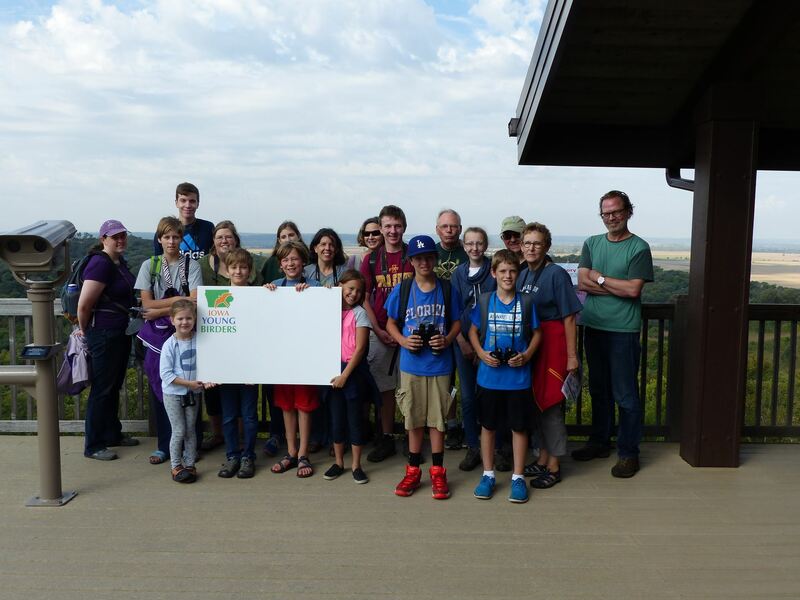 September 24, a beautiful fall morning at Hitchcock Nature Area in the heart of the Loess Hills where 24 young birders, parents, grandparents, and friends enjoyed spending time in the hawk watch tower and raptor banding blind. Everyone was excited for this unique experience and anxious to get started. Some of us started the morning with Bethany Thornton in the hawk watch tower. Bethany shared with us the importance of counting migrating raptors and some tips for identifying raptors in flight. The birds were slow to get started, but we soon spotted a distant Great Blue Heron, some Turkey Vultures starting to lift off, and an occasional Osprey riding the winds with their “m-shaped” wings. In between bouts of scanning the horizon, we were able to pick out some good birds in the trees below including a Wilson’s Warbler, Eastern Towhee, and we even heard a Red-breasted Nuthatch. The rest of us started the morning in the raptor banding blind with experienced raptor bander Jerry Toll. Jerry shared with us his many experiences banding raptors. Although the nothing was caught in the first hour, we were lucky to get several close looks of different raptors including an Osprey. We also got up-close looks at and learned about the equipment needed to capture hawks. It was very exciting! Young birders, parents, and friends rotated into the hawk watch tower and raptor banding blind for the remainder of the morning. We were treated with a Cooper’s Hawk captured at the banding blind, and several other good birds from the hawk watch tower and adjacent nature center including Cooper’s, Sharp-shinned, and Broad-winged Hawks, a Peregrine Falcon, and even an adult Sabine’s Gull! Even though a storm front rained out some of us in the banding blind, we still had a great morning on this unique experience! We’re grateful to Bethany Thornton and Jerry Toll for sharing their knowledge and experience with us, and to volunteer Ross Silcock for his leadership. You can view photos from our field trip here and our complete species list here. 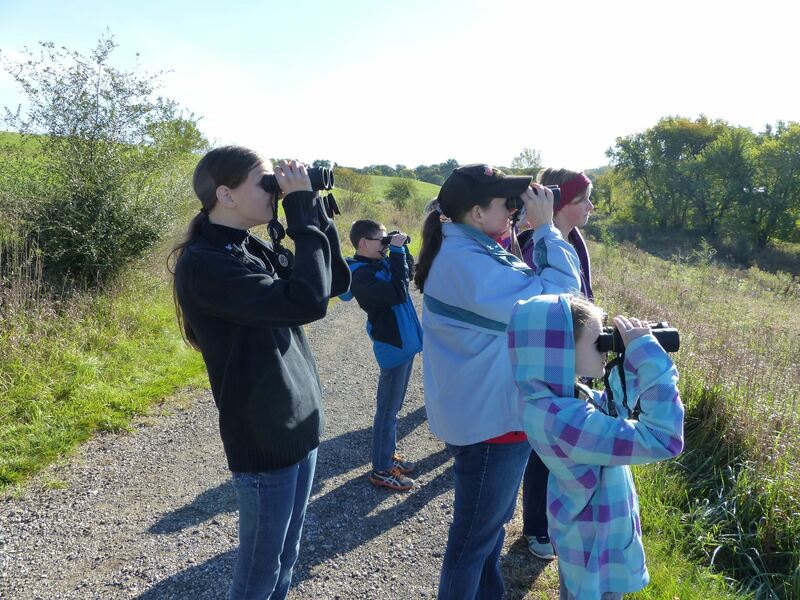 Iowa Young Birders is committed to encouraging the development of young birders, which is why we're excited to offer our Camp Scholarships for a third year. Scholarships of up to $500 will be given to one or more young birders interested in attending one of the American Birding Association Young Birder Camps or any other approved young birder camp. 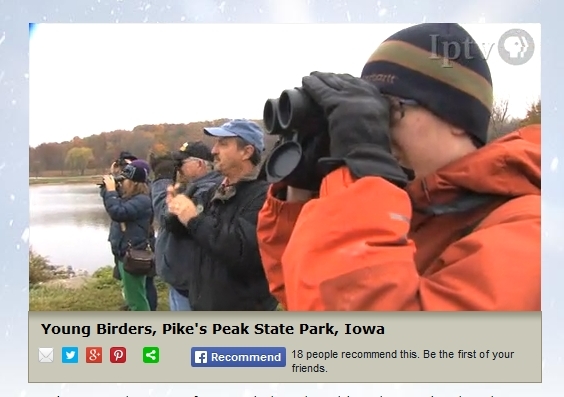 Scholarships are open to any young birder who is an Iowa resident and 13-18 years of age. "These camps are a great way for young birders to not only improve their skills, but also connect with other young birders from across the country and develop a lifetime of friendships," said Tyler Harms, Executive Director of Iowa Young Birders. "We're lucky to have the generous support of many donors who appreciate the importance of these opportunities for young birders." The deadline for scholarship applications is February 1. For more information about these scholarships, to apply, or to make a donation to our scholarship fund, click here. Want to know what we've been doing all summer? Check out our August Member and Friends Newsletter here!